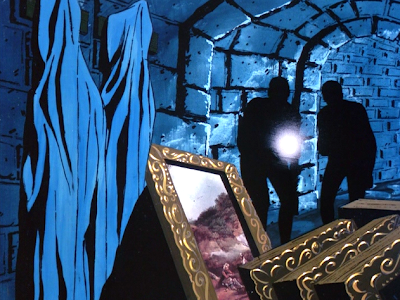 In “Invasion of the Underdwellers,” Ape City suffers a number of robberies of precious historical artifacts and objects, including Zira’s precious first edition of the collected works of William Apespeare. 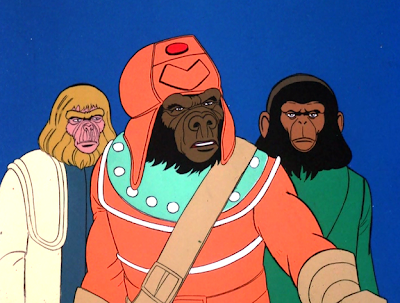 Eyewitnesses report to the Ape Council that the Under Dwellers are responsible, but the real culprit is General Urko. He plans to use the robberies as an excuse to invade Under Dweller territory and start a war. The astronauts, meanwhile, learn from Krador, leader of the Under Dwellers, that Urko has stashed the valuable items in the Tomb of the Unknown Ape, on the outskirts of the city. Something intriguing and unusual happens in “Invasion of the Underdwellers.” The series’ villain, Urko, actually faces consequences for his behavior. 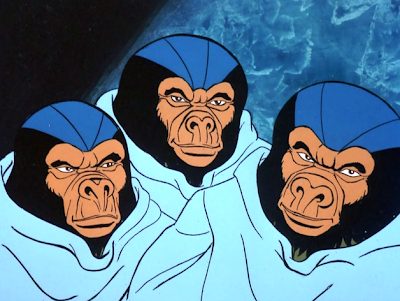 While many other animated series of the same era exist in a kind of permanent status quo -- where no change occurs, season after season -- Return to the Planet of the Apes (1975) permits for characters to react meaningfully to the changes that occur in their lives. In this case, Dr. Zaius acts reasonably when he learns of Urko’s misdeeds. He suspends the guy without pay, and demands he deliver a TV apology to the ape-nation. This is an important development, and it sets in motion the events that occur throughout the remainder of the series. It’s also a nice bow to realism. In real life, Urko wouldn’t be able to get away with rank corruption and insubordination again and again without someone at least taking notice, or reprimanding him. Fact is, he probably would have been replaced because of his sheer incompetence long before this particular installment. Another aspect of this episode that seems realistic: a man (or ape) in power trying to forward his agenda by misleading a nation into war. 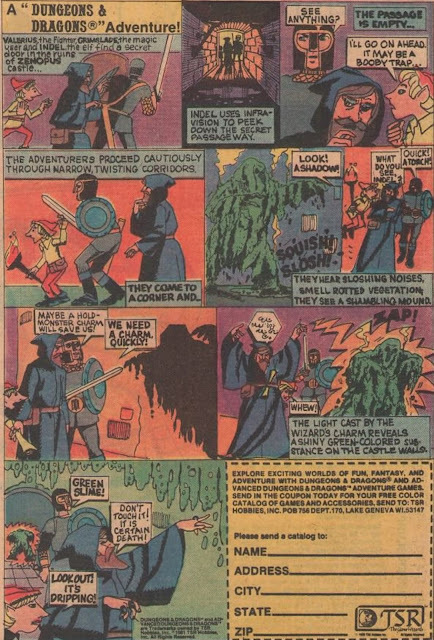 In this case, Urko gins up fear of the Under Dwellers to make the populace pliable, and even fosters outrage by jeopardizing treasures of ape heritage. Once such primitive emotions are engaged, the war machine is not easy to stop, and we have certainly seen such things happen in our own history. The only aspect of the episode that plays a little goofy to me is this notion that all Ape works of art have the word “ape” in them. Like the Ape-a-Lisa (Mona Lisa), or the works of Apespeare (Shakespeare). An earlier episode featured a popular movie called The Apefather (The Godfather), and this notion has always seemed odd to me. I mean, we don’t go around putting the word “human” or “man” in front of everything. John good review of this intriguing episode. "Ape" everything must have been aimed at the children viewing back in '75, like us. 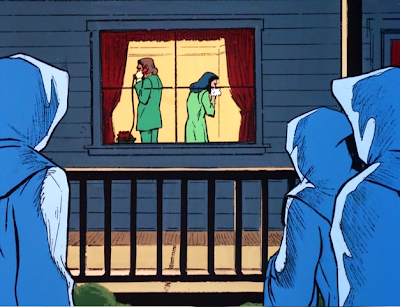 Perhaps it was the writers utilizing the '60s Adam West Batman series labeling everything "Bat".